online Naval resources is one of the responsibilities of Victor S. Gavin, Deputy Assistant Secretary of the Navy for Command, Control, Communications, Computers, Intelligence (C4I), Information Operations and Space. FedScoop spoke with Gavin recently about how the Navy has shifted its approach to serving Navy personnel electronically, and how the convergence of technology and applications is changing the way the Navy approaches not only the online customer experience of Navy personnel, but how it acquires, develops and deploys information technology across the department. FedScoop: What steps have you and your team taken over the past year or so to improve the digital customer experience of Navy personnel and recruits? Victor Gavin: In order to be more customer-focused, we’ve changed the paradigm from delivering IT products to delivering IT Services. 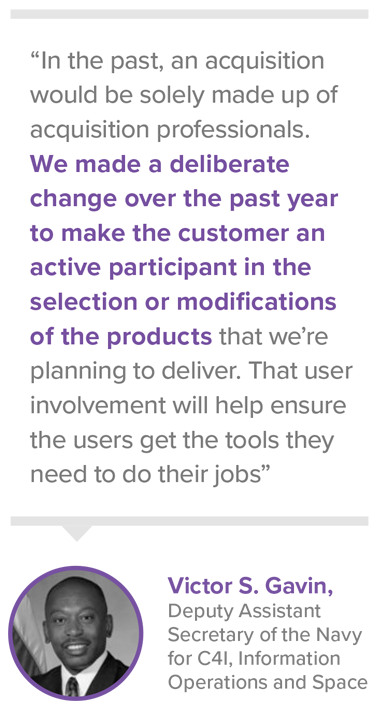 That change of delivering services is huge, because it requires the acquisition community to be more customer-focused. When developing and delivering products, it is a very technical event based on pre-determined and approved requirements – you focus on meeting the specification that is in front of you. Given the rapid pace of change in the IT industry, our acquisition process must include a way to buy the state of the practice capabilities without time consuming changes to contract language. Service acquisition is the solution. The acquisition of IT Services changes our business model, and requires more interaction and feedback from the customer to ensure the IT Service meets the users’ needs. Rather than solely focusing on specific requirements and detailed technical specifications required to develop a product, we focus more on system outcomes which are specified by higher-level requirements. This provides the information needed to conduct market research and identify available commercial service providers. Once a commercial solution is selected, we then work with the user community to change our operational processes to match the selected commercial product. The old process would drive us to customize the commercial product to match our existing processes. While this process makes sense in the when acquiring ships and planes, it is more costly and delays the delivery of needed IT capability to the fleet. To implement this approach we have changed the make-up of our Program Offices. In the past, a Program Office would be solely made up of acquisition professionals. We made a deliberate change to that over the past year to where we’re actually bringing the customer into the program offices and making them an active participant in acquisition of these services. Their primary role is to spearhead the business process re-engineering which changes our processes to match the acquired product. Having the “customer” represented in the acquisition program office helps ensures the tools meet their needs and provides advocacy for the required process changes. FedScoop: Can you point to ways a Sailor, a recruit or a retiree might see a difference or an improvement in their digital customer experience? Gavin: We have taken full advantage of the mobile technologies that we use every day. The assumption right now is that anybody we’re going to recruit is going to be from a generation that is used to having smart phones and tablets in their hands. We’re depending on their working knowledge of mobility devices and cloud-based, app store environments. Therefore, we’re writing applications deliberately for this IT savvy generation. 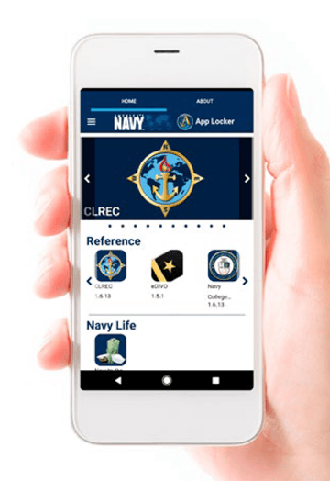 There’s a series of tools that we’re creating, and we have in our app store, the Navy App Locker, to help our workforce do their day-to-day jobs, conduct training, manage their career, track their healthcare and personal fitness. Additionally, we’re allowing our workforce to provide feedback and input into future tools as well as opportunities to develop and propose tools. Currently, we’re on pace to release a new application about once every three months. FedScoop: How would say that newer customer experience benefits them? Gavin: This process allows sailors to directly contribute to the capability of the force. The workforce will have more input into the tools they use, so they’ll get the tools they require, and they’ll get them a lot quicker. This technique will result in efficiencies across the workforce. FedScoop: What else are you doing differently to help speed up this improvement process? Gavin: Real simple. We’re taking advantage of the tools that are available today. In the past, we used to develop unique tools and maintain them in our own IT environments. We would test and certify things ourselves. But in today’s IT marketplace, where we are not the expert, it makes more sense to be a fast follower of industry rather than attempt to develop IT products and services ourselves. We can’t, nor should we, attempt to outpace the IT sector of which we represent a very small percent of the user-base. Again, IT is completely different from the military industrial base where we design and build ships and aircraft. The young sailors and marines we recruit today are used to going to an app store, searching for applications, finding what he or she needs, downloading the apps and using them immediately. We need to adopt this type of environment to become more efficient and agile. In doing so, we don’t want to recreate those environments within the military space; we want to leverage what the IT industry has already developed, tested and proved to be useful and reliable. FedScoop: Beyond apps are there other ways you’re trying to improve the customer experience using technology? And are you able to quantify some of the results? Gavin: The other side of technology is the IT infrastructure that is making this happen. We’re making a deliberate effort to use the commercial infrastructure that’s out there, and buying IT the way it is sold, to include commercial-off-the-shelf hardware and commercial cloud services. We’re buying cloud services from providers like Amazon and Microsoft, as opposed to expanding our own data centers. This move to cloud based services not only changes our application hosting model but will impact the way we develop applications it in the future. By using commercial cloud providers we cut down on the need of Navy unique application environments and have ready access to the latest technologies for our applications. This in turn will cut the development timeline and increase our pace of capability delivery. FedScoop: Looking ahead, what additional steps are in the works to improve customer experience? Gavin: From a strategist standpoint, we’re trying to focus on industry best practices, and we’re working hard to change the culture of the workforce to embrace the buy vs build mindset. One of the major things you’re seeing in the IT community today is the convergence of technologies and applications, and we’re trying to do the same here. Whereas there may have been several, sometimes hundreds, of applications or tools for similar tasks, we’re converging those into much fewer applications and making the data available in the cloud so we can benefit from more robust data analytics. For example, if you look at our manpower, personnel, training and education portfolio, there’s something like 85 different applications. We have various personnel systems, career management systems, pay systems, and pay distribution systems. All these systems and commercial applications can be converged into fewer systems creating a simpler and more robust user experience. FedScoop: How are you trying to pull all that together? Gavin: It started with a clear vision and buy-in from our senior leadership. From a technology standpoint, our plan is to “buy as it is sold” and not to build anything. We are substituting “building” with “configuring”. Commercial products are designed to be “configured” and we must limit our modifications to that only. Configuration allows the product to be improved by the commercial provider without the need for costly and time consuming rework. The hard part is the culture. The use of commercial products the way they are designed and sold, will require changes to our internal processes and changes to our organizational culture. If you have an organization that is set up around 85 unique applications, you can merge those apps into something much smaller, but you can imagine the internal resistance by those who have to change their day-to-day practices. The same convergence in technology is required to reshape the IT workforce, which must happen inside of our military development organizations in order to maintain the pace and speed and customer satisfaction metrics that we so desire. We have one of the greatest workforces in the world, and they are up to the challenge. In the end, we will be more efficient and effective, but these efficiencies may result in some of the workforce being repurposed to focus on more important missions and tasks. This article is part of a series on digital customer experience in government produced by FedScoop and sponsored by Accenture.